All black is an away kit style that City first tried in 2003/04, and it quickly became associated with success as the Tigers clinched promotion at Yeovil clad in all black. City went back to black for the 2014/15 Premier League season, beginning the campaign at QPR in the away kit. 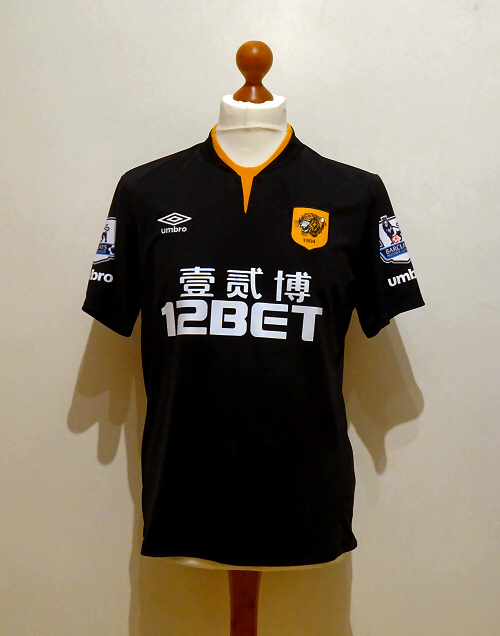 This shirt is player issue, and has the full player size Premier League sleeve patches, numbers and letters. The shirt was swapped with a Manchester City player after the 1-1 draw at the Etihad Stadium, a game substitute Abel Hernadez did not feature in, making it bench worn at least. If the shirt has been worn in a game Hernandez played in, then it’s the 2-2 draw at Arsenal that ‘Abel H.’ scored in, but that’s near impossible to prove.